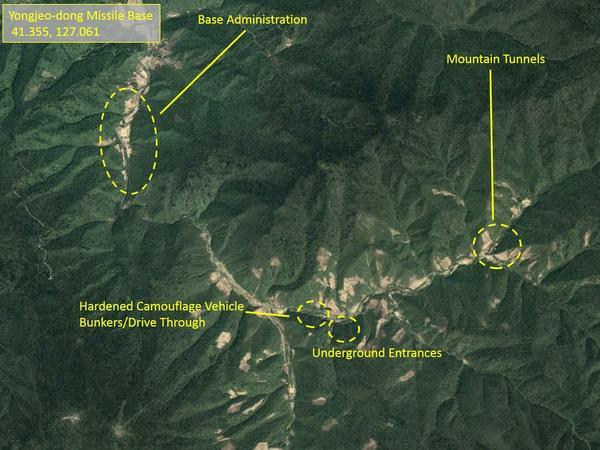 Satellite images reveal tunneling and other construction activity at two sites believed to house long-range missiles. The base would very likely be used to house longer-range missiles, such as this Hwasong-12, which is capable of reaching Guam. North Korea has not tested any long-range missiles following a summit between President Trump and North Korea's Kim Jong Un. But it continues to expand its bases for such missiles. 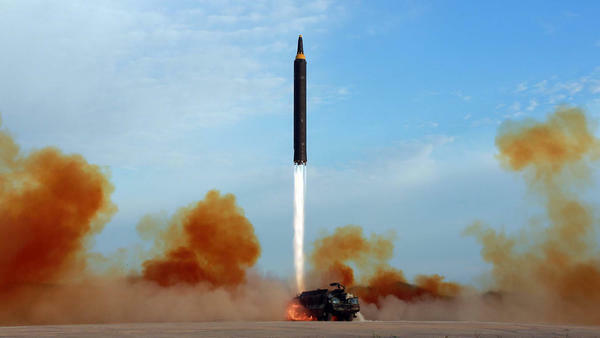 The base, located near the Chinese border, is believed to be capable of housing long-range missiles that could, in theory, hit the United States. Researchers say they see clear signs that the base is being upgraded. The work was first reported by CNN. "They are constructing hardened drive-through shelters for the vehicles that would carry the long-range missiles," says Catherine Dill, a senior research associate with the Middlebury Institute of International Studies, which conducted the analysis. "And they are also constructing tunnel entrances." Dave Schmerler, a research associate at Middlebury who worked on the imagery, says it's not clear whether the missiles have actually been deployed to the site. According to imagery from commercial providers such as Planet and Google Earth, the construction appears to be taking place at the existing facility, the Yeongjeo-dong missile base, and a second site, known as Hoejung-ri, around 7 miles away. It's unclear whether the new site is an extension of the existing base or an entirely new one. Either way, the evidence clearly shows that the North is continuing to expand its missile capabilities, Dill says. Last year, North Korea tested long-range missiles that put the entire continental United States within range. Separately, the North also tested a powerful nuclear weapon. The North officially suspended its testing around the time of a summit in Singapore between President Trump and North Korean leader Kim Jong Un. But that voluntary moratorium did not apply to the bases that might house the missiles, Dill says. At these facilities, construction appears to be continuing apace. "They started construction before the Singapore summit and they've continued it since then," Dill says. The bases are believed to serve as shelters for mobile missile launchers. 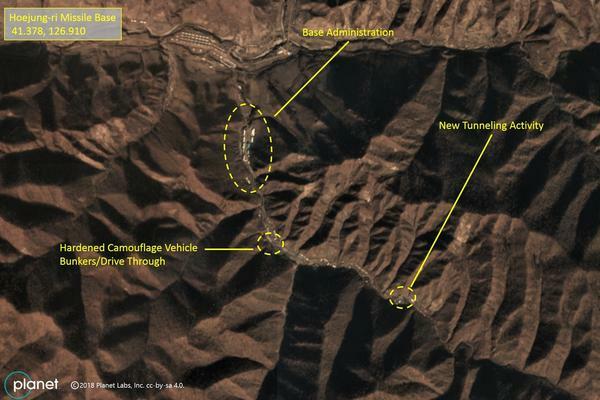 If North Korea came under attack, the trucks could be fueled and armed in hardened underground facilities. They would then drive to any one of a number of predetermined sites and fire their missiles at the enemy. This is the second missile base to be spotted by independent researchers in recent weeks. Last month, a separate group found an active missile base that was not widely known to the public. That base is believed to house much-shorter-range missiles than the base announced Wednesday. News today that North Korea has been expanding one of its missile bases. That's according to a new analysis of satellite imagery. NPR's Geoff Brumfiel has more. GEOFF BRUMFIEL, BYLINE: The U.S. knew about this base. It's in a remote mountain valley in the very northern part of the country right near the Chinese border. JEFFREY LEWIS: So it's very hard to get to. BRUMFIEL: Jeffrey Lewis with the Middlebury Institute of International Studies speaking on Skype. He was part of the team that looked at commercial satellite images. And when he and others looked carefully, they noticed something else about seven miles away. LEWIS: It was extremely well-camouflaged, and we had not noticed it before. BRUMFIEL: A new base or maybe an extension. And at this new facility, the North Koreans are digging big time, creating a giant underground cavern in the side of a mountain. LEWIS: You can just see from the amount of dirt and rock that they've pulled out from the tunnel how large it is. It's one of the larger North Korean underground facilities I've ever seen. BRUMFIEL: This new underground facility probably has just one purpose, Lewis says, to house North Korea's largest missiles, like the intercontinental ballistic missiles it claims can strike the U.S. The digging has been taking place all year, even after President Trump's June summit with North Korean leader Kim Jong Un. Trump has touted the summit as a success. Here he is talking about it at a rally back in October. PRESIDENT DONALD TRUMP: No more rockets, right? I say all the time, no more rockets, no more missiles, no more nuclear testing. BRUMFIEL: So is the North going back on its word? No, says Eric Brewer. He worked in the Trump White House coordinating sanctions against the North. And he says Kim Jong Un promised not to test but said nothing about missile bases. ERIC BREWER: There's no deception here. He's not breaking any of his commitments that he has made. BRUMFIEL: Trump now wants another summit. Brewer says there's been no lower-level talks to discuss things like the bases. He worries the summit will go badly without the preparation. BREWER: I think we put ourselves in a dangerous position when we put President Trump and Kim Jong Un in the room together to try and agree to some of these details. BRUMFIEL: So far, the North has declined to meet at a lower level. Trump says he hopes the next summit can happen early next year. Geoff Brumfiel, NPR News, Washington. Transcript provided by NPR, Copyright NPR.